There's another Clowney headed to play football in the SEC, and this defensive end is a demon just like his cousin was ... literally. Demon Clowney, a four-star defensive end in the class of 2020 from Baltimore, committed to play for Ed Orgeron and LSU on Saturday night on Twitter. Clowney (pronounced Da-Mon) is the cousin of current Houston Texans star and former South Carolina defensive end Jadeveon Clowney. Clowney is the No. 5 weak-side defensive and and 124th-ranked player overall in the next recruiting cycle. 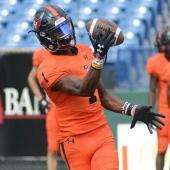 He holds offers from several high-profile programs, including Georgia, Clemson, Texas A&M, Michigan and Penn State, according to his 247Sports profile. Shea Dixon of 247Sports reports that Clowney made his commitment following an unofficial visit to Baton Rouge this weekend. Like his older cousin, Demon Clowney has dominated the game throughout his prep career. "Ever since he was young, he has been bigger and faster than everybody else," Sam Poggi, Clowney's position coach at St. Frances Academy, said in an interview with Bleacher Report. "And his last name is Clowney. I think it's hard sometimes for him to know who he should be. Should he be himself or the guy everyone wants him to be? There's a battle that goes on inside of him. You look at him, and it's just undeniable. I do think his best days will be in college and beyond, but I will be shocked if he doesn't get to being a highly effective, highly motivated machine. He has it in him." The addition of the 6-foot-4, 225-pounder to LSU's recruiting class vaults the Tigers to the No. 2 spot in the updated 2020 247Sports composite team recruiting rankings.